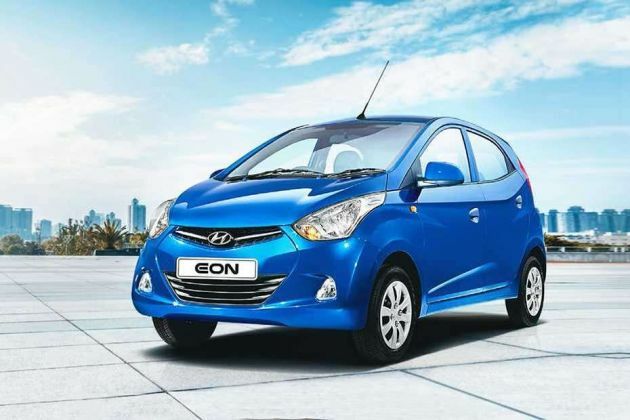 Eon is a compact hatchback from Hyundai which is available in total of six variants. One of them is named as Hyundai Eon Magna Plus , which comes with quite generous features for a small family. It has an attractive outlook with stylish airdam, sporty roof and well designed bumper painted in overall shade. Based on a dual tone theme, its cabin looks quite decent with silver touched center fascia, deluxe floor console and much more. The instrument cluster comes with several warnings and notifications to assist the driver. Coming to its comfort, it includes power accessory socket, air conditioner, remote fuel lid as well as trunk opener. The car maker offers less but impressive safety features, such as power door locks, engine immobilizer, front as well as rear seat belts. Beneath its skin, this trim incorporates an 814cc petrol engine that has a total of 9 valves and is based on a Multi Point Fuel Injection System. The hatchback is pitted against the likes of Maruti Celerio, Datsun Go, Honda Brio, Chevrolet Beat and Renault Kwid. The designers have done a good job with charming chrome tipped radiator grille that is flanked by a clear pair of headlights. A couple of wipers and washer are fitted to its wide front windscreen. However, rear end has an integrated spoiler, tail lamps and a little boot lid with Hyundai emblem in its center. Moreover, it gets tinted glass, manually adjustable external rear view mirrors, 13 inch steel wheels with wheel covers and 155/70 based tubeless radials. Besides these, there is a roof antenna, stunning bumpers and a spare wheel, which is fitted inside its boot compartment. It has a wheelbase of 2380mm, ground clearance of 170mm and a minimum turning radius of 4.6 meters. The insides are done up with beige and brown color combination and equipped with assist grips, bench folding rear seat, a 3-spoke steering wheel, digital clock and an electronic multi tripmeter. There is a center fascia with silver accents, cup holder, floor console storage, exclusive pedestal as well as dashboard spaces, rear parcel tray, map pockets and bottle holder in its front doors. Moreover, this variant incorporates a deluxe floor console, fabric upholstery, B and C pillar trims. For entertainment, it comprises of a 2-DIN music system with a total of four speakers, audio display, CD player, FM/AM radio, AUX-in and USB ports. This variant is powered by a 0.8-litre petrol engine with a single overhead camshaft valve configuration. It includes three cylinders and is paired to a 5-speed manual transmission that powers its front wheels. This model produces a maximum power of 52.2bhp at 5500rpm along with a peak torque of 74.5Nm at 4000rpm, which are good, but could have been slightly better. Moreover, there is a fuel tank capacity of 32-litres. This vehicle returns a minimum fuel efficiency of between 17.0 to 21.1 Kmpl within the city or highways. The runabout takes 19 seconds to reach 100 Kmph from standstill and can attain a top speed of 135 Kmph. There are disc and drum brakes at its front and rear wheels, respectively. However, torsion beam axle is fitted at the rear and McPherson struts equipped to the front ones, which square up the heavy bumps easily. Furthermore, gas type shock absorbers are affixed with all its wheels to further augment this mechanism. There is a full size armrest between the front seats, power windows, internally adjustable outside mirrors and a 12Volt power accessory outlet to charge your few small gadgets. The instrument panel comprises of a low fuel warning light, which warns its driver when the level of fuel becomes low. Besides these, it has a power steering with tilt adjustment function, AC unit and gear shift indicator. A graphic band type of a fuel gauge is provided which indicates the tank level, while a dual tripmeter shows the distance covered by the vehicle. Its fuel tank as well as tail gate can be opened and closed from within. There is a spacious cabin that confers a comfortable seating for a total of 5 people. It can carry about 215-litres of luggage that can be increased further as per your need by folding the rear seats. The manufacturer is offering a reinforced body structure, internal rear view mirror, front and rear seat belts. Furthermore, it has adjustable seats, child safety rear door locks, halogen headlights, centrally mounted fuel tank, anti theft device, side and front impact beams as well. An immobilizer system is available that prevents its engine to start by any other key. This hatchback is also equipped with central locking in order to latch as well as unlatch its doors simultaneously. 1. Comfort features are good. 2. Interiors are pretty stylish. 1. Safety should be improved. 2. Rear seat is too small for taller people.